This addition to the popular GS Mini family features layered walnut back and sides paired with a solid Sitka spruce top. 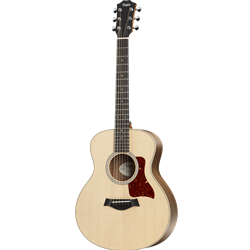 Like its other Mini siblings, our modern-day parlor guitar has wowed the world with its fun-size appeal, packing a grown-up guitar voice into a scaled-down form that fits perfectly into everyday life. As active or relaxed as you want to be, having a Mini on hand is like having your songwriting muse on instant demand. And for beginners, it makes an acoustic guitar feel super-approachable. The Mini ships with a durable, lightweight hard bag, allowing you to take it anywhere. An onboard Taylor ES-B pickup/preamp also enables you to plug in and make your voice heard. It features a built-in tuner, low-battery indicator, and tone and volume controls.